Pay R1 per litre for fuel? Ride electric! Tired yet of putting thousands of Rands in your tank each month? Would you like to pay the equivalent of around R1 per litre for fuel and make your fuel bill so cheap it feels almost free. If you do, the answer is to move forward with an EWIZZ electric scooter. EWIZZ electric scooters are so energy efficient, they offer the equivalent of up to 360 km/l, that’s around 12 times more efficient than a 125cc petrol scooter at 30 km/l and around 36 times more efficient than an average petrol car at 10 km/l. 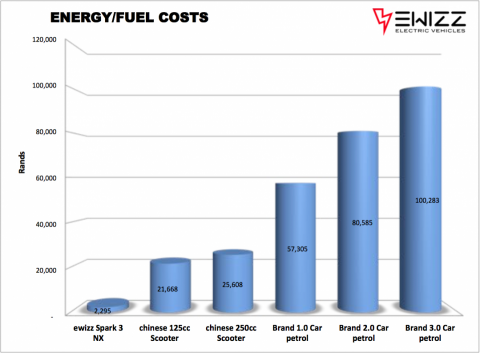 It’s just insanely cheap to fuel an EWIZZ electric scooter, just imagine 1 months car fuel cost lasting nearly 3 years. 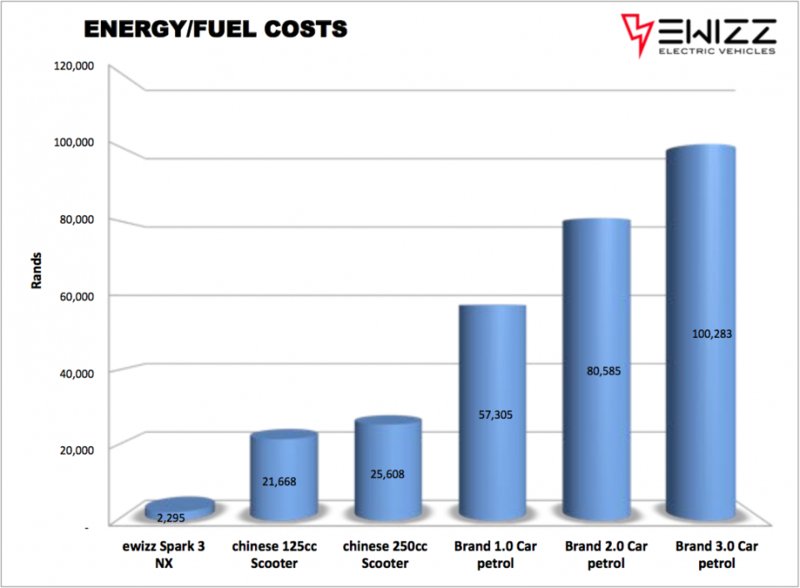 If you ride a petrol scooter, imagine 1 months fuel cost lasting the whole year. Riding an electric scooter has many other advantages like always being first at the lights, zipping through the traffic, free parking, less maintenance and longer service intervals. For example, parts, like brake pads, last much longer with new regenerative braking technology. The regenerative braking is so good some riders will never need to change their brake pads for the life of the scooter. EWIZZ electric scooters are zero emission vehicles and when charged from a clean energy source they produce no emissions. Even with charging from ESKOM, emissions are around a quarter of an equivalent petrol vehicle, so you are doing your bit for the environment. Best of all they need no special charge points as you can plug into any normal 3 pin plug point. At the end of the day, when you consider the “real-cost” of owning your vehicle, EWIZZ electric scooters typically work out at half the total cost of owning a petrol scooter, and compared to a car they feel almost free! If R1 per litre for fuel isn’t cheap enough we even have FREE charge points. Check out the free charge points at Dario’s cafe in Hout Bay. 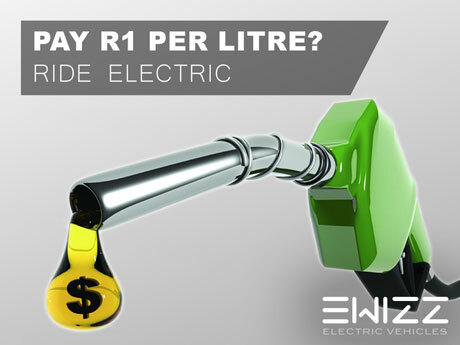 Paying just R1 per litre for fuel is just one of the many benefits of going electric. We all need to save money, save time and save our planet. EWIZZ electric scooters are a great way to do all of these in one go. Come visit us for a coffee and a test ride, you’ll be surprised at the power and range available. Going electric is much easier than you think. EWIZZ electric scooters are simple to ride, safe and you can recharge them at home or work from any 3 pin plug point. If you need help with your test we know people that can help you get your licence quickly, safely and easily. Call us today and arrange your electric experience! Download the full EWIZZ cost comparison PDF here. If you would like a personalised cost comparison then contact us here. Andy is passionate about bringing sustainable mobility to Southern Africa. 3 Responses to "Pay R1 per litre for fuel? Ride electric!" awesome Andy good to see your business is up and running ,wishing lots of success and bike sales . Certainly on my radar for my next scooter! "Please keep me in the loop as I have an interest t"
"Hi Lawrence, yes these are all road legal and regi"